SARAH: AND MY KINGDOM IS AS GREAT. SARAH: FOR MY WILL IS AS STRONG AS YOURS. SARAH: MY KINGDOM IS GREAT. SARAH: OH, I CAN NEVER REMEMBER THAT LINE. SARAH: "YOU HAVE NO POWER OVER ME." SARAH: I DON'T BELIEVE IT! IT'S 7:00! SARAH: OH, IT'S NOT FAIR! MOTHER: DON'T STAND THERE IN THE RAIN! SARAH: ALL RIGHT. COME ON, MERLIN. MOTHER: GO ON. INTO THE GARAGE. MOTHER: SARAH, YOU'RE AN HOUR LATE. SARAH: I SAID I'M SORRY. MOTHER: YOUR FATHER AND I GO OUT VERY RARELY. SARAH: YOU GO OUT EVERY WEEKEND! MOTHER: ONLY IF IT WON'T INTERFERE WITH YOUR PLANS. SARAH: YOU DON'T EVEN ASK WHAT MY PLANS ARE. MOTHER: I ASSUME YOU'D TELL ME IF YOU HAD A DATE. MOTHER: YOU SHOULD HAVE DATES AT YOUR AGE. FATHER: WE WERE WORRIED ABOUT YOU. SARAH: I CAN'T DO ANYTHING RIGHT! MOTHER: SHE TREATS ME LIKE A WICKED STEPMOTHER. FATHER: I'LL TALK TO HER. SARAH: TO TAKE BACK THE CHILD THAT YOU HAVE STOLEN. FATHER: COULD I TALK TO YOU? SARAH: THERE'S NOTHING TO TALK ABOUT! SARAH: YOU BETTER HURRY. YOU'LL BE LATE. FATHER: WE'VE FED TOBY AND PUT HIM TO BED. FATHER: WE'LL BE BACK AROUND MIDNIGHT. SARAH: YOU REALLY WANTED TO TALK TO ME, DIDN'T YOU? SARAH: PRACTICALLY BROKE DOWN THE DOOR! SARAH: SOMEONE HAS BEEN IN MY ROOM AGAIN! SARAH: SOMEONE TAKE ME AWAY FROM THIS AWFUL PLACE! SARAH: WHAT DO YOU WANT? SARAH: DO YOU WANT A STORY? SARAH: WHOSE STEPMOTHER ALWAYS MADE HER STAY HOME WITH THE BABY. SARAH: THE BABY WAS A SPOILED CHILD. SARAH: AND THE GIRL WAS PRACTICALLY A SLAVE. SARAH: AND GAVE HER CERTAIN POWERS. SARAH: SHE ASKED THE GOBLINS FOR HELP. SARAH: AND YOU WILL BE FREE." SARAH: AND SHE COULD NO LONGER STAND IT. SARAH: OH, ALL RIGHT! ALL RIGHT! SARAH: STOP IT! STOP IT! GOBLIN: SHE'S GOING TO SAY IT! GOBLIN: LISTEN! SHE'S GOING TO SAY THE WORDS. SARAH: I CAN BEAR IT NO LONGER! SARAH: GOBLIN KING! GOBLIN KING! SARAH: TAKE THIS CHILD OF MINE FAR AWAY FROM ME! GOBLIN: WHERE'D SHE LEARN THAT RUBBISH? GOBLIN: IT DOESN'T EVEN START WITH "I WISH"! SARAH: OH, TOBY, STOP IT! SARAH: TO MAKE THE GOBLINS TAKE YOU AWAY. GOBLIN: "I WISH THE GOBLINS WOULD COME TAKE YOU AWAY RIGHT NOW!" GOBLIN: DID SHE SAY IT? GOBLINS: SHUT UP! SHUT UP! SARAH: TOBY, ARE YOU ALL RIGHT? SARAH: WHY AREN'T YOU CRYING? SARAH: YOU'RE HIM, AREN'T YOU? SARAH: YOU'RE THE GOBLIN KING. SARAH: I WANT MY BROTHER BACK, IF IT'S ALL THE SAME. JARETH: WHAT'S SAID IT SAID. SARAH: I DIDN'T MEAN IT. SARAH: PLEASE BRING HIM BACK. JARETH: GO BACK TO YOUR ROOM. JARETH: PLAY WITH YOUR TOYS AND YOUR COSTUMES. JARETH: FORGET ABOUT THE BABY. JARETH: I'VE BROUGHT YOU A GIFT. JARETH: IT WILL SHOW YOU YOUR DREAMS. JARETH: WHO TAKES CARE OF A SCREAMING BABY. JARETH: DO YOU WANT IT? JARETH: THEN FORGET THE BABY. SARAH: BUT I WANT MY BROTHER BACK. SARAH: HE MUST BE SCARED. GOBLINS: HA HA! HA HA! JARETH: YOU'RE NO MATCH FOR ME. SARAH: I NEED MY BROTHER BACK. JARETH: HE'S THERE IN MY CASTLE. JARETH: DO YOU STILL WANT TO LOOK FOR HIM? SARAH: IS THAT THE CASTLE BEYOND THE GOBLIN CITY? JARETH: TURN BACK BEFORE IT'S TOO LATE. SARAH: DON'T YOU UNDERSTAND THAT I CAN'T? JARETH: IT'S FURTHER THAN YOU THINK. SARAH: IT DOESN'T LOOK THAT HARD. SARAH: CAN YOU HELP ME GET THROUGH THIS LABYRINTH? HOGGLE: NO, I AIN'T. I'M HOGGLE. HOGGLE: THAT'S WHAT I THOUGHT. SARAH: DO YOU KNOW WHERE THE DOOR TO THE LABYRINTH IS? SARAH: WELL, WHERE IS IT? SARAH: I SAID WHERE IS IT? HOGGLE: NOT IF YOU ASK THE RIGHT QUESTIONS. 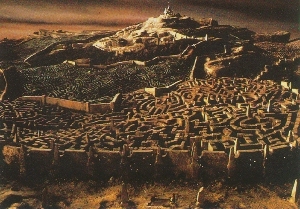 SARAH: HOW DO I GET INTO THE LABYRINTH? HOGGLE: NOW, \THAT'S\ MORE LIKE IT. HOGGLE: YOU GETS IN THERE. HOGGLE: YOU REALLY GOING IN THERE, ARE YOU? SARAH: I'M AFRAID I HAVE TO. HOGGLE: HA HA HA HA! HOGGLE: NOW, WOULD YOU GO LEFT OR RIGHT? SARAH: THEY BOTH LOOK THE SAME. HOGGLE: YOU'RE NOT GOING TO GET VERY FAR. SARAH: HOW WOULD YOU GO? HOGGLE: ME? I WOULDN'T GO EITHER WAY. SARAH: IF THAT'S ALL YOU'LL SAY, YOU CAN LEAVE. HOGGLE: YOU KNOW YOUR PROBLEM? HOGGLE: YOU TAKE TOO MUCH FOR GRANTED. HOGGLE: YOU'LL NEVER GET OUT AGAIN. HOGGLE: IT'S MUCH BETTER THAN YOURS. HOGGLE: AND DON'T SAY I DIDN'T WARN YOU. SARAH: WHAT DO THEY MEAN, "LABYRINTH"? SARAH: THERE AREN'T ANY TURNS OR CORNERS OR ANYTHING. SARAH: THIS JUST GOES ON AND ON. SARAH: MAYBE I'M JUST TAKING IT FOR GRANTED THAT IT DOES. WORM: NO, I SAID 'ALLO, BUT THAT'S CLOSE ENOUGH. SARAH: YOU'RE A WORM, AREN'T YOU? SARAH: DO YOU KNOW THE WAY THROUGH THIS LABYRINTH? WORM: NO. I'M JUST A WORM. WORM: COME AND MEET THE MISSUS. SARAH: BUT I HAVE TO SOLVE THIS LABYRINTH. SARAH: THERE AREN'T ANY TURNS OR OPENINGS. SARAH: IT JUST GOES ON AND ON! WORM: IT'S FULL OF OPENINGS. WORM: JUST YOU AIN'T SEEIN' THEM. WORM: THERE'S ONE RIGHT ON FRONT OF YOU. WORM: COME INSIDE AND HAVE SOME TEA. SARAH: BUT THERE ISN'T AN OPENING. WORM: OF COURSE THERE IS. WORM: TRY WALKIN' THROUGH IT. WORM: YOU'LL SEE WHAT I MEAN. SARAH: THAT'S JUST WALL. THERE'S NO WAY THROUGH. WORM: SO YOU CAN'T TAKE ANYTHING FOR GRANTED. SARAH: THANK YOU. THAT WAS INCREDIBLY HELPFUL. WORM: BUT DON'T GO THAT WAY! WORM: DON'T GO THAT WAY. WORM: NEVER GO \THAT\ WAY. WORM: SHE'D HAVE GONE STRAIGHT TO THAT CASTLE. GOBLIN: GET OUT OF THE WAY! GOBLIN: WHAT ARE YOU TALKING ABOUT? JARETH: HA HA HA HA! GOBLINS: HA HA HA HA! GOBLIN: IS A-WRITING ON THE FRAGGING WALK-WALK! SARAH: SOMEONE HAS BEEN CHANGING MY MARKS. SARAH: WHAT A HORRIBLE PLACE! IT'S NOT FAIR! JIM: THAT'S RIGHT. IT'S NOT FAIR. GUARDS: HA HA HA HA! JIM: THAT'S ONLY HALF OF IT. TIM: NO, THAT'S THE DEAD END BEHIND YOU. GUARDS: HA HA HA! HA HA HA! SARAH: WHAT AM I SUPPOSED TO DO? JIM: TRY ONE OF THESE DOORS. RALPH: BA BA BA BUM! JIM: WE CAN'T TELL YOU. RALPH: IT'S IN THE RULES. RALPH: AND ONE OF US ALWAYS LIES. SARAH: ALL RIGHT. ANSWER YES OR NO. SARAH: THAT THIS DOOR LEADS TO THE CASTLE? ALPH: WHAT DO YOU THINK? SARAH: AND THIS DOOR LEADS TO CERTAIN DEATH. ALPH: HE COULD BE TELLING THE TRUTH. SARAH: THE ANSWER IS NO. ALPH: I COULD BE TELLING THE TRUTH. SARAH: THEN HE'D BE LYING. SARAH: THE ANSWER WOULD STILL BE NO. RALPH: I DON'T KNOW. I'VE NEVER UNDERSTOOD IT. SARAH: NO, IT'S RIGHT. I'VE FIGURED IT OUT. SARAH: I COULDN'T DO IT BEFORE. SARAH: I THINK I'M GETTING SMARTER. HANDS: WHAT DO YOU MEAN, "HELP"? HANDS: WOULD YOU LIKE US TO LET GO? HANDS: WELL, THEN, COME ON. HANDS: WE HAVEN'T GOT ALL DAY! HANDS: WELL, IT'S A BIG DECISION. HANDS: WHICH WAY DO YOU WANT TO GO, HMM? SARAH: I GUESS I'LL GO DOWN. HANDS: TOO LATE NOW. HA HA HA HA! JARETH: SHE'S IN THE OUBLIETTE. JARETH: SHE SHOULD HAVE GIVEN UP BY NOW. JARETH: SHE HAS TO START ALL OVER AGAIN. HOGGLE: SO I'VE COME TO GIVE YOU A HAND. HOGGLE: OH, YOU'RE LOOKING AROUND. HOGGLE: THIS IS AN OUBLIETTE. HOGGLE: LABYRINTH'S FULL OF THEM. SARAH: I DIDN'T KNOW THAT. HOGGLE: WHAT AN OUBLIETTE IS. HOGGLE: TO FORGET ABOUT THEM. HOGGLE: IS GET OUT OF HERE. HOGGLE: OUT OF THE LABYRINTH. SARAH: NO! I'M NOT GIVING UP NOW. SARAH: I'VE COME TOO FAR! SARAH: NO, I'M DOING OK.
HOGGLE: OF COURSE YOU ARE. HOGGLE: FROM HERE ON IN. SARAH: WHY ARE YOU SO CONCERNED ABOUT ME? HOGGLE: WELL, I AM, THAT'S ALL. SARAH: YOU LIKE JEWELRY, DON'T YOU? SARAH: I'LL GIVE YOU THIS. SARAH: YOU LIKE IT, DON'T YOU? HOGGLE: THE WAY OUT OF THE LABYRINTH. SARAH: YOU WERE GOING TO DO THAT ANYWAY. HOGGLE: A PARITCULARLY NICE GESTURE. SARAH: AND THEN I'LL DO IT ON MY OWN. HOGGLE: WHAT IS THAT, ANYWAY? HOGGLE: BUT I'LL TAKE YOU AS FAR AS I CAN. HOGGLE: THEN YOU'RE ON YOUR OWN, RIGHT? HOGGLE: WELL, CAN'T BE RIGHT ALL THE TIME. HOGGLE: AH! THIS IS IT. HOGGLE: OOH. HA HA HA! ROCKFACE: GO BACK WHILE YOU STILL CAN. ROCKFACE: THIS IS NOT THE WAY. ROCKFACE: TAKE HEED, AND GO NO FURTHER. ROCKFACE: SOON IT WILL BE TOO LATE. HOGGLE: THEY'RE JUST FALSE ALARMS. HOGGLE: ESPECIALLY WHEN YOU'RE ON THE RIGHT TRACK. ROCKFACE: OH, NO, YOU'RE NOT. ROCKFACE: SORRY. JUST DOING MY JOB. ROCKFACE: FOR SUCH A LONG TIME. HOGGLE: DON'T EXPECT A BIG REACTION. ROCKFACE: NO, NO, NO. OF COURSE NOT. ROCKFACE: WILL LEAD TO CERTAIN DESTRUCTION! ROCKFACE: THANK YOU VERY MUCH. JARETH: WHAT HAVE WE HERE? HOGGLE: YOUR MAJESTY! WHAT A NICE SURPRISE! JARETH: HOGGLE, ARE YOU HELPING THIS GIRL? JARETH: IN THE SENSE OF LEADING HER TOWARDS THE CASTLE. HOGGLE: I WAS TAKING HER BACK TO THE BEGINNING. HOGGLE: I TOLD HER I WOULD HELP HER. HOGGLE: WHERE DID THIS COME FROM? JARETH: IN THE BOG OF ETERNAL STENCH. HOGGLE: NOT THE ETERNAL STENCH! JARETH: HOW ARE YOU ENJOYING MY LABYRINTH? SARAH: IT'S A PIECE OF CAKE. JARETH: THEN HOW ABOUT UPPING THE SPAKES? JARETH: YOU SAY THAT SO OFTEN. JARETH: I WONDER WHAT YOUR BASIS FOR COMPARISON IS. JARETH: THE LABYRINTH'S A PIECE OF CAKE? JARETH: LET'S SEE YOU DEAL WITH THIS SLICE. HOGGLE: OH, NO, THE CLEANERS! HOGGLE: YOU SURE GOT HIS ATTENTION! SARAH: I CAN'T TRUST YOU. SARAH: YOU WERE TAKING ME BACK TO THE BEGINNING. HOGGLE: TO THROW HIM OFF THE SCENT. SARAH: HOW CAN I BELIEVE ANYTHING YOU SAY? HOGGLE: LET ME PUT IT THIS WAY. HOGGLE: WHAT CHOICE HAVE YOU GOT? HOGGLE: SEE, YOU'VE GOT TO UNDERSTAND MY POSITION. HOGGLE: I'M A COWARD, AND JARETH SCARES ME. HOGGLE: NO POSITION. THAT'S MY POINT. HOGGLE: THE BOG OF ETERNAL STENCH. SARAH: IS THAT ALL IT DOES IS SMELL? HOGGLE: BELIEVE ME, THAT'S ENOUGH. HOGGLE: YOU'LL SMELL BAD THE REST OF YOUR LIFE. HOGGLE: IT'LL NEVER WASH OFF. HOGGLE: HERE WE ARE, THEN. HOGGLE: YOU'RE ON YOUR OWN FROM NOW ON. HOGGLE: I SAID I'D TAKE YOU AS FAR AS I COULD. SARAH: YOU LITTLE CHEAT. YOU NASTY CHEAT! HOGGLE: NOW, DON'T TRY TO EMBARRASS ME. HOGGLE: I'VE GOT NO PRIDE. HOGGLE: BUT THEM'S MY JEWELS! HOGGLE: OH, YOU, GIVE THEM BACK! HOGGLE: GIVE THEM BACK! GIVE THOSE BACK! HOGGLE: OH, GIVE THOSE BACK TO ME! SARAH: WHICH WAY SHOULD WE TRY? HOGGLE: THEM'S MY RIGHTFUL PROPERTY! SARAH: BUT THAT'S THE WAY IT IS. SARAH: BUT CAN YOU HELP ME? WISEMAN: OH! A YOUNG GIRL! WISEMAN: AND WHO IS THIS? WISEMAN: OH. WHAT CAN I DO FOR YOU? SARAH: AT THE CENTER OF THE LABYRINTH. SARAH: DO YOU KNOW THE WAY? WISEMAN: YOU WANT TO GET TO THE CASTLE? HAT: HOW'S THAT FOR BRAINPOWER, HUH? WISEMAN: THE WAY FORWARD IS SOMETIMES THE WAY BACK. HAT: WILL YOU LISTEN TO THIS CRAP! WISEMAN: WILL YOU PLEASE BE QUIET! HAT: HA! JOIN THE CLUB! HAT: I, UH, I THINK THAT'S YOUR LOT. HAT: PLEASE LEAVE A CONTRIBUTION IN THE LITTLE BOX. HOGGLE: DON'T YOU DARE! THEM'S MINE. SARAH: I GUESS I CAN SPARE THIS. HOGGLE: YOU DIDN'T HAVE TO GIVE HIM THAT. HOGGLE: HE DIDN'T TELL YOU NOTHING. HAT: THERE GO A COUPLE OF SUCKERS. HAT: AH! IT'S SO STIMULATING BEING YOUR HAT. HOGGLE: WHY DID YOU SAY I WAS YOUR FRIEND? SARAH: YOU'RE NOT MUCH OF A FRIEND. SARAH: BUT YOU'RE THE ONLY FRIEND I'VE GOT. SARAH: DO YOU HEAR SOMETHING? SARAH: NO, THAT'S ALL RIGHT. HOGGLE: FRIEND. HUH! I LIKE THAT. HOGGLE: I AIN'T NEVER BEEN NO ONE'S FRIEND BEFORE. SARAH: ARE YOU MY FRIEND OR NOT? HOGGLE: NO! HOGGLE AIN'T NO ONE'S FRIEND. HOGGLE: HE LOOKS AFTER HIMSELF, LIKE EVERYONE. HOGGLE: HOGGLE IS HOGGLE'S FRIEND. SARAH: WELL, I'M NOT AFRAID. GOBLIN: TRY THIS FOR SIZE, YOU BIG YETI! GOBLIN: WE GOT YOU NOW, FUZZBALL! GOBLIN: NIPPY, NIPPY, NIP, NIP! GOBLIN: BITE HIM ON THE TERIYAKI! GOBLIN: SAKI TO HIM! SAKI TO HIM! GOBLIN: WHO TURNED OUT THE LIGHTS? GOBLIN: HEY, WHY'D YOU BITE ME? GOBLIN: WHY'D YOU BITE ME? GOBLIN: I CAN'T SEE! I CAN'T SEE! GOBLIN: ALL RIGHT, WHO BIT ME? GOBLIN: OH, MY ACHING SUSHI! SARAH: THAT'S NO WAY TO TREAT SOMEONE WHO'S HELPING YOU. SARAH: DON'T YOU WANT ME TO HELP YOU DOWN? SARAH: IS THAT YOUR NAME? SARAH: OH, YOU SEEM LIKE SUCH A NICE BEAST. SARAH: YOU ARE WHAT YOU SEEM TO BE. SARAH: JUST HANG ON. I'LL GET YOU DOWN. SARAH: LUDO, ARE YOU HURT? SARAH: OH, HERE, LET ME HELP YOU. SARAH: NOW, WAIT. JUST A SECOND. SARAH: I WANT TO ASK YOU SOMETHING, LUDO. SARAH: AT THE CENTER OF THE LABYRINTH? SARAH: YOU DON'T KNOW, EITHER? SARAH: HOW TO GET THROUGH THIS LABYRINTH. HOGGLE: GET THROUGH THE LABYRINTH? HOGGLE: SHE'LL NEVER GET THROUGH THE LABYRINTH. SARAH: WHERE DID THEY COME FROM? SARAH: WHAT DO YOU THINK, LUDO? SARAH: OUT OF THESE TWO UGLY CHARACTERS? KNOCKER1: IT'S VERY RUDE TO STARE! SARAH: I WAS JUST WONDERING WHICH DOOR TO CHOOSE. KNOCKER2: HS DF ASA PST. KNOCKER1: DON'T TALK WITH YOUR MOUTH FULL! KNOCKER2: I'M NT TLKG WTH MY MTH FLL! SARAH: I CAN'T UNDERSTAND YOU. KNOCKER1: WHAT WERE YOU SAYING? KNOCKER2: IT IS SO GOOD TO GET THAT THING OUT! SARAH: WHAT WERE YOU SAYING? KNOCKER2: IT'S NO GOOD TALKING TO HIM. KNOCKER2: HE'S DEAF AS A POST. KNOCKER1: MUMBLE, MUMBLE. YOU'RE A WONDERFUL CONVERSATIONAL COMPANION. KNOCKER2: ALL YOU DO IS MOAN. KNOCKER1: NO GOOD. CAN'T HEAR YOU. SARAH: WHERE DO THESE DOORS LEAD? KNOCKER2: SEARCH ME. WE'RE JUST THE KNOCKERS. SARAH: HOW DO I GET THROUGH? KNOCKER2: KNOCK, AND THE DOOR WILL OPEN. KNOCKER2: I DON'T WANT THAT BACK IN MY MOUTH. SARAH: I WANT TO KNOCK. KNOCKER1: DOESN'T WANT HIS RING BACK IN HIS HOUTH, EH? KNOCKER1: CAN'T SAY I BLAME HIM. KNOCKER2: THAT'S ALL RIGHT. I'M USED TO IT. JARETH: HE'S A LIVELY LITTLE CHAP. JARETH: I THINK I'LL CALL HIM JARETH. JARETH: HE'S GOT MY EYES. GOBLINS: HA HA HA! HA HA HA! SARAH: OH, GIVE ME YOUR HAND. SARAH: SEE, LUDO, THERE'S NOTHING TO BE AFRAID OF. SARAH: LUDO, WHERE ARE YOU? JARETH: IF IT ISN'T YOU. JARETH: AND WHERE ARE YOU GOING? HOGGLE: BACK TO THE BEGINNING LIKE YOU TOLD ME. JARETH: I THOUGHT YOU WERE RUNNING TO HELP HER. JARETH: NOT AFTER MY WARNINGS. JARETH: THAT WOULD BE STUPID. HOGGLE: YOU BET IT WOULD! JARETH: OH, DEAR. POOR HOGHEAD. JARETH: I'VE JUST NOTICED YOUR LOVELY JEWELS ARE MISSING. HOGGLE: MY LOVELY JEWELS, MISSING. HOGGLE: I'D BETTER FIND THEM. HOGGLE: TO THE BEGINNING OF THE LABYRINTH. JARETH: I'VE GOT A MUCH BETTER PLAN. HOGGLE: WILL IT HURT HER? HOGGLE: I WON'T HARM HER. JARETH: LOSING YOUR HEAD OVER A GIRL. HOGGLE: I AIN'T LOST MY HEAD. JARETH: COULD LIKE A REPULSIVE LITTLE SCAB LIKE YOU, DO YOU? JARETH: OR I'LL TIP YOU STRAIGHT INTO THE BOG OF ETERNAL STENCH! JARETH: I'LL TURN YOU INTO A PRINCE. JARETH: PRINCE OF THE LAND OF STENCH! HA HA HA! FIREY: WE'RE OUT TO HAVE A GOOD TIME. FIREY: DON'T LOSE YOUR HEAD. FIREY: HEY, I'M A WILD CHILD! FIREY: BLEH! BLUB BLUB BLUB BLUB! FIREY: SHAKE YOUR PRETTY LITTLE HEAD. FIREY: TAP YOUR PRETTY LITTLE FEET. FIREY: COME ON, COME ON! FIREY: HER HEAD DON'T COME OFF! FIREY: SHE'S RIGHT. IT'S STUCK ON. FIREY: WHERE YOU GOING WITH A HEAD LIKE THAT? FIREY: I KNOW WHAT WE CAN DO. FIREY: TAKE OFF HER HEAD! FIREY: YEAH, LET'S TAKE HER APART! FIREY: HEY, LADY, THAT'S HIS HEAD. FIREY: HEY, THAT'S MY HEAD. FIREY: THAT'S A FRIEND OF MINE. FIREY: WHAT ARE YOU DOING? FIREY: TO THROW OTHER PEOPLE'S HEADS. FIREY: YOU'RE ONLY ALLOWED TO THROW YOUR OWN HEAD. FIREY: NOW WE TAKE YOUR HEAD OFF! FIREY: COME BACK, LITTLE LADY. FIREY: WHO GETS TO THROW YOUR HEAD? FIREY: HEY, YOU CAN'T QUIT! FIREY: THE GAME'S NOT OVER! FIREY: WE GET A FREE THROW. FIREY: TO TAKE YOUR HEAD OFF? FIREY: YOU CAN LOOK LIKE US! FIREY: TAKE OFF YOUR HEAD! FIREY: LET US TAKE OFF YOUR ARM! FIREY: AN EAR! TAKE OFF YOUR EAR! FIREY: YOU DON'T NEED TWO EARS. FIREY: THE GAME'S ALMOST OVER. SARAH: YOU'VE COME TO HELP ME! HOGGLE: NO. DON'T KISS ME! DON'T KISS ME! HOGGLE: NO, NO, NO, NO, NO! SARAH: UH! WHAT IS IT? SARAH: I'VE NEVER SMELT ANYTHING LIKE IT. HOGGLE: IT DOESN'T MATTER WHAT IT'S LIKE. HOGGLE: IT'S THE BOG OF ETERNAL STENCH. HOGGLE: AND DO A THING LIKE THAT FOR? SARAH: DON'T PRETEND TO BE SO HARD. SARAH: AND I KNOW YOU'RE MY FRIEND. HOGGLE: DID NOT! AM NOT! HOGGLE: I'VE JUST COME TO GET ME PROPERTY BACK. HOGGLE: GET OFF OF ME! SARAH: IT'S OK. THIS IS LUDO. SARAH: HE'S A FRIEND, TOO. HOGGLE: AND YOU'LL STINK FOREVER. SARAH: WE HAVE TO GET ACROSS. DIDYMUS: WITHOUT MY PERMISSION, NO ONE MAY CROSS. SARAH: I DON'T HAVE MUCH TIME. HOGGLE: WE'VE GOT TO GET OUT OF THIS STENCH. DIDYMUS: STENCH? OF WHAT SPEAKETH THOU? DIDYMUS: I LIVE BY MY SENSE OF SMELL. DIDYMUS: AND NONE MAY PASS WITHOUT MY PERMISSION! HOGGLE: OH, GET OUT OF MY WAY! DIDYMUS: I'M SWORN TO DO MY DUTY! SARAH: LET US GET ACROSS. DIDYMUS: I DON'T WANT TO HURT YOU! SARAH: HOGGLE, WHAT ARE YOU DOING? DIDYMUS: LET GO OF MY STAFF! DIDYMUS: ALL RIGHT, THEN. I CAN CONQUER THIS MOUNTAIN. DIDYMUS: THOU MUST DO BETTER THAN THAT! DIDYMUS: GIVE UP? HA HA! SARAH: ARE YOU ALL RIGHT, LUDO? DIDYMUS: SIR LUDO, I, SIR DIDYMUS, YIELD TO THEE. DIDYMUS: AND FIGHT FOR THE RIGHT AS ONE! DIDYMUS: THANK YOU VERY MUCH. DIDYMUS: WELL MET, SIR LUDO. DIDYMUS: YOU FORGET MY SACRED VOW, MY LADY. DIDYMUS: I CANNOT LET YOU PASS. SARAH: BUT LUDO IS YOUR BROTHER. DIDYMUS: I MUST DEFEND MY OATH TO THE DEATH. SARAH: LET'S HANDLE THIS LOGICALLY. SARAH: WHAT EXACTLY HAVE YOU SWORN? DIDYMUS: NO ONE SHALL PASS WITHOUT MY PERMISSION. SARAH: MAY WE HAVE YOUR PERMISSION? DIDYMUS: THIS BRIDGE HAS LASTED FOR 1,000 YEARS. DIDYMUS: IT SEEMED SOLID ENOUGH. DIDYMUS: WHEN YON MAIDEN NEEDS OUR HELP? DIDYMUS: CANST THOU SUMMON UP THE VERY ROCKS? DIDYMUS: SIR LUDO, WAIT FOR ME! DIDYMUS: IT'S ALL RIGHT, AMBROSIOUS. DIDYMUS: YOU CAN COME OUT NOW. DIDYMUS: AH, STEADY! STEADY, BOY. DIDYMUS: JUST CLOSE YOUR EYES AND GO. DIDYMUS: EXCUSE US. THANK YOU. HOGGLE: I CAN'T GIVE IT TO HER. DIDYMUS: WELL, COME ON, THEN. DIDYMUS: WE SHOULD REACH THE CASTLE WELL BEFORE DAY. JARETH: IS THIS WHAT YOU'RE TRYING TO FIND? JARETH: BUT NOT FOR LONG. JARETH: JUST AS SOON AS HOGGLE GIVES HER MY PRESENT. JARETH: THEN SHE'LL FORGET EVERYTHING. DIDYMUS: IS THAT MY STOMACH OR YOURS, AMBROSIOUS? SARAH: WELL, WE CAN'T STOP NOW. SARAH: MAYBE WE CAN FIND SOME BERRIES. SARAH: HOGGLE, WHAT HAVE YOU DONE? HOGGLE: OH, DAMN YOU, JARETH! HOGGLE: AND DAMN ME, TOO! DIDYMUS: THE CASTLE DOTH LIE YONDER, MY LADY. HOGGLE: OH, SHE'LL NEVER FORGIVE ME. HOGGLE: WHAT HAVE I DONE? HOGGLE: I'VE LOST MY ONLY FRIEND, THAT'S WHAT I'VE DONE. SARAH: WHAT WAS I DOING? JUNKLADY: GET OFF MY BACK! JUNKLADY: WHERE \WERE\ YOU GOING? JUNKLADY: IF YOU DON'T \KNOW\ WHERE YOU'RE GOING. JUNKLADY: WASN'T IT, MY DEAR? SARAH: IT WAS JUST A DREAM. SARAH: I DREAMED IT ALL, LANCELOT. SARAH: BUT IT WAS SO REAL. SARAH: LET'S GO SEE IF DADDY'S BACK, OK? JUNKLADY: BETTER TO STAY IN HERE, DEAR. JUNKLADY: THERE'S NOTHING YOU WANT OUT THERE. JUNKLADY: OH, WHAT HAVE WE GOT HERE? JUNKLADY: YOUR LITTLE BUNNY RABBIT! JUNKLADY: YOU LIKE YOUR LITTLE BUNNY RABIT. JUNKLADY: OH, AND THERE'S BETSY BOO. JUNKLADY: WHAT ELSE HAVE WE GOT? JUNKLADY: LET'S HAVE A LOOK. JUNKLADY: IT'S A PENCIL BOX. JUNKLADY: GOT LOTS OF PENCILS! JUNKLADY: HERE'S YOUR PANDA SLIPPERS. JUNKLADY: YOU LIKE YOUR PANDA SLIPPERS! JUNKLADY: YOU NEVER WANTED THEM THROWN AWAY, DID YOU? JUNKLADY: NOW, THEN, WHAT ELSE? JUNKLADY: OH, IT'S LITTLE HORSIE. JUNKLADY: YOU LOVE LITTLE HORSIE, DON'T YOU. JUNKLADY: AND LOOK AT THIS! JUNKLADY: YOU GOT A PRINTING GAME. JUNKLADY: YOU'LL WANT THAT, WON'T YOU, MY DEAR? JUNKLADY: AND HERE'S DEAR OLD FLOPSIE. JUNKLADY: OH, YES. CHARLIE BEAR. JUNKLADY: THERE'S CHARLIE BEAR FOR YOU, HMM? SARAH: THERE WAS SOMETHING I WAS LOOKING FOR. JUNKLADY: AH, DON'T TALK NONSENSE. JUNKLADY: IS ALL RIGHT HERE. JUNKLADY: HERE'S YOUR LITTLE TOY CANDY SHOP! SARAH: TO TAKE BACK THE CHILD THAT YOU HATH STOLEN." JUNKLADY: WHAT'S THE MATTER, MY DEAR? JUNKLADY: DON'T YOU LIKE YOUR TOYS? JUNKLADY: WELL, WHAT ABOUT THIS? JUNKLADY: THIS IS NOT JUNK. SARAH: I HAVE TO SAVE TOBY! DIDYMUS: ARE YOU ALL RIGHT? DIDYMUS: THOU ART SAFE AT LAST! DIDYMUS: MY LADY, LOOK! WE'RE ALMOST THERE. DIDYMUS: THE GATES TO THE GOBLIN CITY. SARAH: WE DON'T HAVE MUCH TIME. SARAH: SIR DIDYMUS, WE MUST GO QUIETLY. DIDYMUS: OPEN UP! OPEN UP RIGHT NOW! SARAH: YOU'LL WAKE THE GUARD. DIDYMUS: WELL, LET THEM ALL WAKE UP! DIDYMUS: I SHALL FIGHT YOU ALL TO THE DEATH! SARAH: FOR MY SAKE, HUSH! DIDYMUS: I'M NOT A COWARD? DIDYMUS: AMBROSIOUS, BE QUIET NOW. DIDYMUS: I DON'T SEE WHY WE HAVE TO BE SO QUIET? DIDYMUS: IT'S ONLY A GOBLIN CITY. DIDYMUS: WILL YOU COME HERE! DIDYMUS: AMBROSIOUS, COME HERE RIGHT NOW! HOGGLE: GET OUT OF THERE! GOBLIN: THAT WASN'T VERY NICE. HOGGLE: HOW DO YOU DRIVE THIS? DIDYMUS: COME HERE AT ONCE. SARAH: GET OUT OF THERE, HOGGLE! SARAH: OH, HOGGLE, ARE YOU ALL RIGHT? HOGGLE: I'M NOT ASKING TO BE FORGIVEN. HOGGLE: I AIN'T ASHAMED OF MYSELF. HOGGLE: JARETH MADE ME GIVE YOU THAT PEACH. HOGGLE: I DON'T CARE WHAT YOU THINK. HOGGLE: I TOLD YOU I WAS A COWARD. HOGGLE: I AIN'T INTERESTED IN BEING FRIENDS. SARAH: I FORGIVE YOU, HOGGLE. DIDYMUS: AND I COMMEND YOU. DIDYMUS: RARELY HAVE I SEEN SUCH COURAGE. DIDYMUS: YOU ARE VALIANT, SIR HOGGLE. LUDO: HOGGLE AND LUDO FRIENDS. SARAH: HERE ARE YOUR THINGS, HOGGLE. SARAH: THANKS FOR YOUR HELP. HOGGLE: WELL, WHAT ARE WE WAITING FOR? HOGGLE: LET'S GET THAT RAT WHO CALLS HIMSELF JARETH. DIDYMUS: AMBROSIUS, IT'S SAFE NOW. DIDYMUS: NOTHING TO BE AFRAID OF. GOBLIN: YOUR HIGHNESS! YOUR HIGHNESS! GOBLIN: THE GIRL WHO ATE THE PEACH AND FORGOT EVERYTHING! GOBLIN: ARE ON THE WAY TO THE CASTLE! JARETH: STOP HER! CALL OUT THE GUARDS. JARETH: SHE MUST BE STOPPED! SARAH: I THINK WE'RE GOING TO MAKE IT! HOGGLE: OH, PIECE OF CAKE! DIDYMUS: NO, NOT THAT WAY! DIDYMUS: YOU'RE GOING THE WRONG WAY! DIDYMUS: THE BATTLE'S BEHIND US! DIDYMUS: AMBROSIUS, CAN WE PLEASE TALK ABOUT THIS? SARAH: OK, COME ON, GUYS. DIDYMUS: OR I WILL NEVER FEED YOU AGAIN! DIDYMUS: DON'T WORRY. I THINK WE'VE GOT THEM SURROUNDED. GOBLIN: I HIT SOMETHING, YES? SARAH: WE'VE GOT TO FIND DIDYMUS. DIDYMUS: HA HA HA! TALLYHO! HOGGLE: OOH, HOW'S LUDO GOING TO GET IN? GOBLIN: YOU IN THERE, YOU'RE SURROUNDED! SARAH: LUDO, CALL THE ROCKS! DIDYMUS: AMBROSIUS, UNLOCK THIS DOOR! DIDYMUS: SO, HAD ENOUGH, HAVE YOU? DIDYMUS: AND I'LL SEE THAT YOU'RE WELL-TREATED. GOBLIN: OK, I TAKE IT BACK! GOBLIN: RUN FOR YOUR LIVES! GOBLIN: I'M GOING TO BED! GOBLIN: GET OUT OF MY HOUSE! GOBLIN: HEY, I JUST FIRED YOU! GOBLIN: NOW WE HAVE YOU! HOGGLE: AND NOW YOU DON'T! DIDYMUS: WHOA, BOY! WHOA, BIG FELLA! DIDYMUS: AH, YES. UP YOU GO! SARAH: HE MUST HAVE GONE THAT WAY. HOGGLE: WELL, THEN, COME ON! SARAH: THAT'S THE WAY IT'S DONE. DIDYMUS: THEN THAT'S THE WAY YOU MUST DO IT. SARAH: THANK YOU, ALL OF YOU. JARETH: BUT I CAN BE CRUEL. SARAH: WHAT HAVE YOU DONE THAT'S GENEROUS? JARETH: EVERYTHING THAT YOU WANTED I HAVE DONE. JARETH: YOU ASKED THAT THE CHILD BE TAKEN. JARETH: YOU COWERED BEFORE ME. I \WAS\ FRIGHTENING. JARETH: I HAVE REORDERED TIME. JARETH: AND I HAVE DONE IT ALL FOR YOU! JARETH: TO YOUR EXPECTATIONS OF ME. SARAH: AND KINGDOM IS GREAT. JARETH: I ASK FOR SO LITTLE. SARAH: DAMN! I CAN NEVER REMEMBER THAT LINE. JARETH: AND I WILL BE YOUR SLAVE. SARAH: TO BELONG TO YOU NOW. FATHER: SARAH, ARE YOU HOME? SARAH: YEAH! YES, I'M HOME. HOGGLE: WELL, WHY DIDN'T YOU SAY SO? FIREY: HA HA HA HA HA! DIDYMUS: DOES ANYONE WANT TO PLAY SCRABBLE?